Milk thistle is a plant native to the Mediterranean and milk thistle benefits have been reported in aiding several human diseases and conditions. Most of these benefits are more along the lines of cultural medicinal traditions than medically-researched and proven facts. Milk thistle is in the same family as sunflowers and its black seeds are harvested in the same way. It is the seeds which provide the substance used in teas and supplements. The milk thistle plant also goes by the names of holy thistle and Mary thistle. The active ingredient in milk thistle is Silymarin, which is considered to be both an antioxidant and an anti-inflammatory. While there has been and will continue to be research on milk thistle, so far the studies have proved inconclusive. Some people seem to receive positive milk thistle benefits and others experience no change at all. Milk thistle benefits are said to include aiding many types of liver problems. Among these are cirrhosis of the liver, hepatitis, jaundice and conditions of the gall bladder. It is sometimes recommended as a supplement for people who are heavy alcohol drinkers to try to minimize alcohol’s effects in causing liver disease. While some studies have shown milk thistle benefits in this use, in other trials, people have shown no improvement at all. There will be much more study to determine if milk thistle can help people with liver problems. There may be milk thistle benefits for diabetics. Scientific research conducted thus far shows that type 2 diabetics do experience lower blood sugar levels when ingesting milk thistle. There are also indications that it improves insulin resistance, another symptom that is present in type 2 diabetes. In the studies, use of milk thistle was in combination with other treatments for diabetes. Because of the many health effects of diabetes, people should not add milk thistle to their diets without discussing the situation first with their doctor. 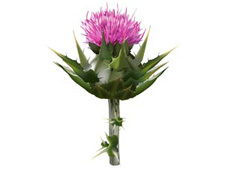 One of the potential benefits of milk thistle is that it may help prevent heart disease. In studies with diabetics, milk thistle has helped to lower bad (LDL) cholesterol. It is not yet known if this characteristic is similar for people without diabetes or for those who suffer primarily with high cholesterol or heart disease. Milk thistle does have some antioxidant properties. Antioxidants are known to prevent by free radicals, toxins in the body and environment which break down healthy cells. Antioxidants are known to prevent many conditions and diseases, including some types of cancer, such as prostate and breast cancer. The antioxidants in milk thistle are still being studied to see what positive effects they might have. You can read on many websites on the internet that herbs and herbal mixtures have no negative effects on the body. That type of statement is completely false and can mislead many people into thinking that no herb can harm them. Many herbs have been used for centuries, even thousands of years, as treatments for certain medical conditions. Some are accepted by the medical community and some are not. The fact that they are not accepted by modern medicine does not necessarily mean those herbal treatments are bad for you. But everyone should understand that herbs often have very powerful chemicals in them and not everyone’s personal reaction to these substances can be known. Just because herbs are considered a natural treatment does not negate the possibility of side effects, particular for those people who take medications for chronic diseases. In the case of milk thistle, there is a possibility of diarrhea and upset stomach. The ingredients also are similar to the effects of estrogen, so women need to be careful about using products containing milk thistle. This includes women with fibroid tumors, endometriosis, as well as women who are either pregnant or breast feeding. Women who have breast cancer, ovarian cancer, or uterine cancer should not take anything containing milk thistle. If you have allergies to weeds, such as ragweed, milk thistle can also cause your allergies to act up. It is in the same plant family as ragweed.